Last night was not a great night for crafting. Our ironing pile no longer remain just that – a pile!, it gave way and collapsed all over the floor leaving me no option but to tackle it. So after was felt like forever, but I’m sure was only a few hours of mindless ironing the night had passed by and left me with very little time to do nice things. 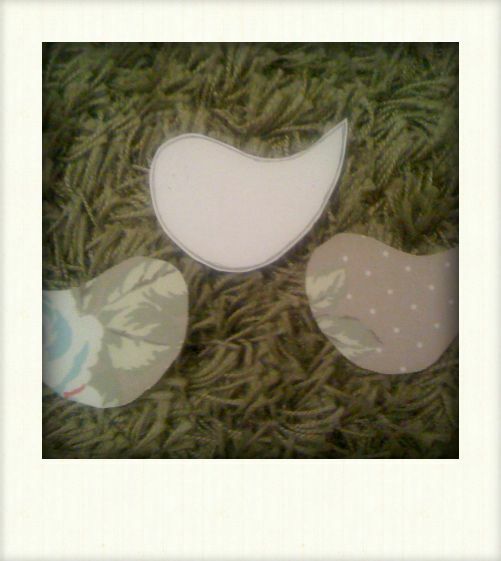 I did, however, manage to draw a little bird outline/pattern and cut out two pieces of material to make one up. I thought it would be lovely to give friends and family little Easter baskets with chocolates, home-made of course, and a little chick/bird in. They would also make a great garland to hang at Easter. The material, which I absolutely love by Clarke & Clarke, was left over from our sitting rooms cushions I made last year. If they turn out good then I’ll post up the little pattern and of course show you how they turned out. Oh yes and the home-made chocolates – they are going to be little men and ladies on sticks. Today in the post arrived the lolly pop moulds. I could have bought Easter bunnies instead of gingerbread men shaped but I thought I’d get more use from these are I could use them all year round!!! Now I only have to wait for the little cellophane bags to arrive and I can try making them. Though they’d look got for Easter with yellow ribbons on.